As the Affordable Care Act is implemented, health care delivery will transition in some way from fee-for-service to outcome-based reimbursement models. For some specialties, such as orthopedic surgery, this change may not be difficult to quantify. For radiology, it may prove more challenging. To help address the coming challenges, the ACR will host the Radiology Leadership Institute annual event from July 25 to 28 at the Kellogg School of Management on Northwestern University’s campus in Evanston, Illinois. The four-day program is designed to help radiologists develop the skills they’ll need to navigate the changing health care landscape, with input from people in the radiology community as well as consultants from other industries. The program will address areas such as identifying operational metrics and processes for improving organizational efficiency, effective negotiating techniques, team building to improve the quality of care, and strategies for managing conflict, dealing with uncertainty, and creating opportunities for improvement. The emphasis is on creating value concepts within radiology practices. “If you’re no longer being reimbursed for the amount of work you do, then you have to provide value to the system in order to justify the compensation that you deserve,” says Lawrence R. Muroff, MD, CEO and president of Imaging Consultants and a clinical professor of radiology at the University of Florida and University of South Florida medical colleges. Muroff says three health care goals are driving modern practice: reducing the number of hospitalizations, decreasing the length of hospital stays, and reducing the rate of patient noncompliance with treatment guidelines, which can lead to higher recidivism rates. Physician best practices can improve the efficiency of care in each of these areas. 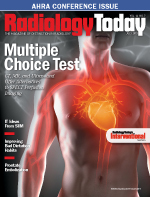 But figuring out which radiology best practices improve care and reduce costs can be difficult. For example, the elimination of unnecessary or inappropriate imaging often is cited as a potential cost savings. But thanks to liability concerns and the culture of defensive medicine, physicians feel compelled to order more tests, and there is scant data available to guide radiology ordering practices. Rather than volume, Muroff advises that radiologists focus on the value of the services they provide, at least until it’s determined whether volume equates to better outcomes. To do that, they will have to start thinking of themselves as members of a team who perform a role in overall patient care, which means coordinating patients’ services with other departments, physicians, and nonphysician professionals more than they have in the past. Essentially, they will need to identify the most effective imaging studies, get the correct answers in the most efficient and cost-effective manner, and make it easier for the referring physician to make the proper diagnosis. Technology such as decision-support software, specialized dashboards, improved physician-to-physician communication tools, and apps that allow the analysis of practice data related to similar practices may help this process, but it will also require a culture change. To begin changing prevailing attitudes, Muroff believes that comparative effectiveness research should be prioritized. Some large health care entities, both academic and private, already are doing some of this research, but Muroff believes more public funding should be made available to expand these and other efforts. He adds that many people believe that patient care can’t be standardized more than it is today, but comparing new approaches with traditional approaches will allow physicians to see where their energies should be directed and which approaches provide less benefit to patients. Muroff says radiologists can do a lot within a team framework, but first they need to figure out how they fit into the new health care dynamic and identify the mechanisms that will allow them to provide constructive input. It will take some time and a significant amount of data analysis, though, to identify the necessary operational metrics and key processes that underlie those mechanisms, and radiologists will need help from professional organizations to crunch those numbers. However, Muroff says these adaptations will increase radiology’s value to health care organizations.